Application for name spinning patent published today. 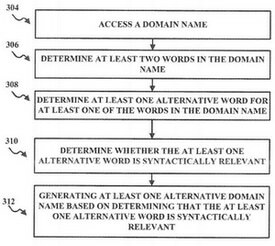 .Com domain name registry Verisign has filed a patent application (pdf) with the U.S. Patent and Trademark Office that covers various aspects of generating domain name alternatives, aka name spinning. The application was filed in December 2015 and just published today. Abstract: Provided are methods, devices, and computer-readable media for accessing a domain name; determining, via the processor, at least two words in the domain name; determining at least one alternative word for at least one word in the domain name; determining whether the at least one alternative word is contextually relevant; and generating at least one alternative domain name based on a determination that the at least one alternative word is contextually relevant. While the application explains a couple different ways of finding the alternative domains, I’m sure many in the domain name business would argue that the crux of the idea has been in practice by multiple parties for over a decade. I see the next trend in the domain industry. Domain name fidget spinner!